March is upon us, which means the time has come for our second (and final) Affiliation Survey this academic year! What does this mean for you? Well, this is that time when we walk around and ask every one of our lovely patrons which program they are with (Dental, Medical, Sackler, etc). This is all we ask. We will not ask for your name or even which year you’re in! The numbers we collect are used in aggregate so we can get a snapshot of what the library usage is like. This post from this past June shows you just what all the numbers ends up looking like. Now here’s how it goes: there are 7 days spread out over the whole month, randomly chosen to try and maximize the usefulness of the numbers (in other words, we’re trying not to get skewed by exam blocks too much). On those days, HHSL staff (you’ll probably recognize us!) will walk around 4 times over the course of the day to gather the totals of how many people from each school are in the library. There will be signs and posters up this month, so you’re not caught unaware. Keep your eyes out for them! We won’t announce ahead of time which days we’re counting (see our need to randomize, above), so it’s safe to assume that it could just happen any day this month. If you don’t want to be bothered (or to speak out loud), you are welcome to leave your ID next to you while you study. If that is still not good enough, you can write your program down on a piece of paper and leave that next to you. If you’re in a group room, feel free to stick a note to the outside of the door (on the wood – the windows must remain clear!) telling us how many people of what program(s) are in the room. Done and done. We will add that number to our count, and we will move on to the next person! There are pencils, pens, markers, scrap paper, and tape down at the Service Desk on the 4th floor, so you can even make your sign bright and cheerful! If you have any questions or concerns, let us know either in person at the desk, or through Ask Us on our website. We’re here to help and make this quick and easy. But otherwise, we look forward to seeing you all this month and finding out just what our beloved HHSL looks like this fine autumn. Good luck on studying and I look forward to seeing you in the library! Hello hello everyone. It’s about that time again: time for the Affiliation Survey! Twice a year, the Hirsh Health Sciences Library runs the Affiliation Survey, where we walk around and ask every one of our lovely patrons which program they are with (Dental, Medical, Sackler, etc). This is all we ask. We will not ask for your name or even which year you’re in! The numbers we collect are used in aggregate so we can get a snapshot of what the library usage is like. 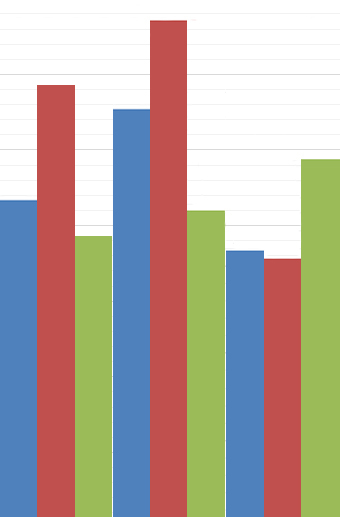 The graph you see above is the result of last year’s two Affiliation months, for instance. Here’s how it goes: there are 7 days spread out over the whole month, randomly chosen to try and maximize the usefulness of the numbers (in other words, we’re trying not to get skewed by specific exam blocks too much). On those days, HHSL staff (you’ll probably recognize us!) will walk around 4 times over the course of the day to gather the totals of how many people from each school are in the library. There will be signs and posters up this month, so you’re not caught unaware. Twice a year, the Hirsh Health Sciences Library runs the Affiliation Survey, where we walk around and ask every one of our lovely patrons which program they are with (Dental, Medical, Sackler, etc). This is all we ask. We will not ask for your name or even which year you’re in! The numbers we collect are used in aggregate so we can get a snapshot of what the library usage is like. You can take a look at my post from July to see how the data turns out. But otherwise, we look forward to seeing you all next month and finding out just what our beloved HHSL looks like this fine spring. 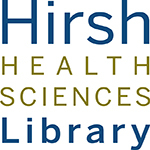 Twice a year, the Hirsh Health Sciences Library runs the Affiliation Survey, where we walk around and ask every one of our lovely patrons which program they are with (Dental, Medical, Sackler, etc). This is all we ask. We will not ask for your name or even which year you’re in! 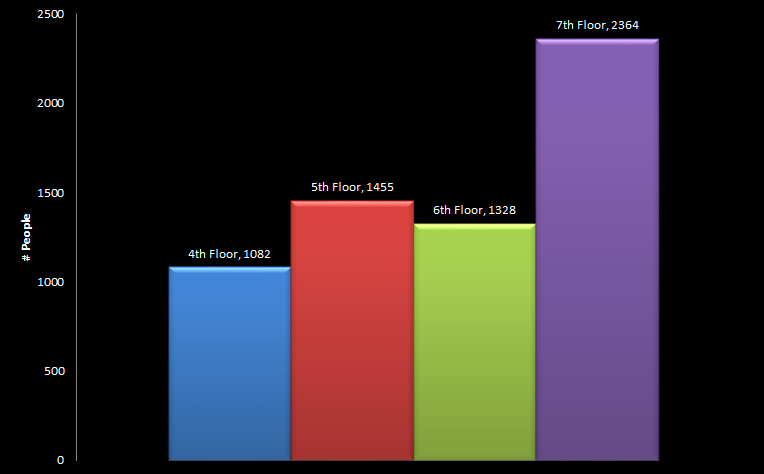 The numbers we collect are used in aggregate so we can get a snapshot of what the library usage is like. Go ahead, take a gander at my post full of graphs from last year. That should give you a good idea of what we do with this info! This academic year we’ve done something different: scattered the days. We’re still collecting 7 days worth of data in October and March, but this time around those 7 days are spread out over the whole month, randomly chosen to try and maximize the usefulness of the numbers (in other words, we’re trying not to get skewed by specific exam blocks too much). Back in October you might have noticed that a few times there were big signs on the floors by the entryways and elevators warning you that we were collecting stats. Well keep your eyes out for them! We won’t announce ahead of time which days we’re counting (see our need to randomize, above), but we don’t want you to be completely off guard, either. If you come into Hirsh and you see one of those tall signs, please know that we will be coming around a few times that day to ask you which program you’re with. But otherwise, we look forward to seeing you all this next month and finding out just what our beloved HHSL looks like this spring. Good luck on studying and all of your exams and projects! It’s that time of the year again! From Sunday, March 6th through Saturday, March 12th, Hirsh Library will be running its Affiliation week survey. Huzzah! What this means for you: 4 times a day (11 am, 3 pm, 6 pm, and 9 pm) a person will come around the library and ask what program you are with. You tell them (Med, Dental, Nutrition, etc), and they’ll move on to the next person. Easy peasy. But what if you don’t want to be interrupted? Well that’s easy enough! You can leave your Tufts ID next to you, and we’ll just glance at that and move on. Or, if you’d rather not leave your ID out, you can just write your program on a piece of paper and leave that next to you. Remember, this is only for the duration of above mentioned week, and then we’ll be done until next October. So it’ll be over before you know it! If you have any questions or concerns, you can come talk to us at the desk on Sackler 4, or call 617-636-6706. We want this to go smoothly and quickly, and for you to be comfortable with it. It’s that time of the year again! From Sunday, October 25th through Saturday, October 31st, Hirsh Library will be running its Affiliation week survey. Huzzah! Remember, this is only for the duration of above mentioned week, and then we’ll be done until April. So it’ll be over before you know it! We do this semi-annually so we can make sure we have the best data about our user base, which lets us allocate resources appropriately to best serve all of the patrons on the Health Sciences campus. You have a couple options for a response: you can always actually tell us (and we’re always happy to talk to you!). However, if you prefer to not speak, you’re welcome to leave your ID next to you while you study, or you can grab a piece of scrap paper from either the 4th or 5th floor desk, and write it down there. If you choose to do that, please make sure the ID or scrap paper is out in the open next to you. If you’re in a group study room with a group, you can write how many members of what schools are represented in the room, and tape it to the outside of the study room door (example: “5 Medical, 3 Dental, 1 Nutrition”). Just please remember to take down any signs you put up, and to remove any IDs or papers you put on the desks by you. If you have any questions or concerns at all, don’t hesitate to ask us! 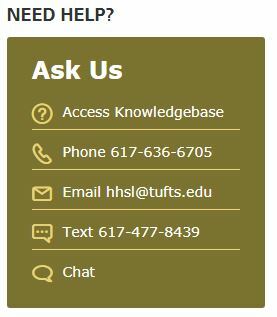 You can call us at 617-636-6706, e-mail us at hhslcirc@tufts.edu, visit our live chat on the Ask Us page, or even just swing by the desk on the 4th floor and chat to us in person. Thank you for your assistance with this, and we look forward to a nice smooth Affiliation Week! Next week, from Sunday, October 19th through Saturday, October 25th, Hirsh Library will be running its semi-annual School Affiliation Survey. The idea behind it is that we want to know where our users are coming from, so that we can better serve their needs through proper allocation of resources. We would also like to know who is being under-served (or at least underrepresented), so we can find new ways to help all of the students, staff, and faculty here on the Boston Campus. If you feel uncomfortable saying your school affiliation out loud, or if you don’t want to be bothered while working, that’s perfectly fine! You have a few options: you can either leave your Tufts ID out, or you can swing by either the 4th or 5th floor desks and grab a piece of paper to write your school on. That way, when the person taking this information comes by, they can just look at either the ID or the paper and move on. If you’re in a group study room with a group, you can write how many members of what schools are represented in the room, and tape it to the outside of the study room door (example: “5 Medical, 3 Dental, 1 Nutrition”). For the first two weeks of April, staff here at the Hirsh Library walked around and asked everyone what school they were from. 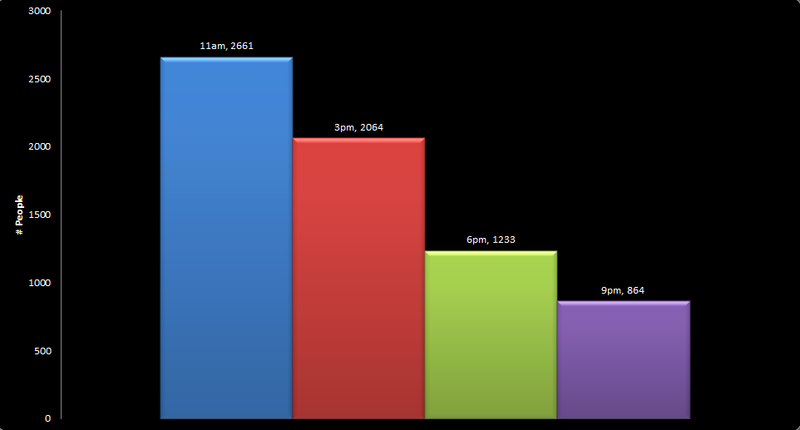 Well, we have tallied some of the results of all of that work, and have uncovered some interesting numbers! Over the course of 13 days and 39 rounds of asking, we talked to 6,884 people. 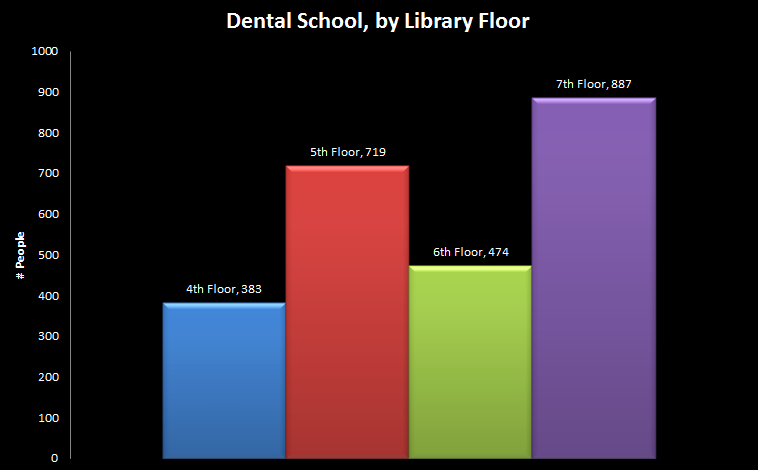 Ultimately, 2,539 of those people were from the Dental school, making that the most populous group we had in the library – a full 37% of the population of Hirsh! Medical came in at a close second of 2,373 people (a difference of a mere 166! 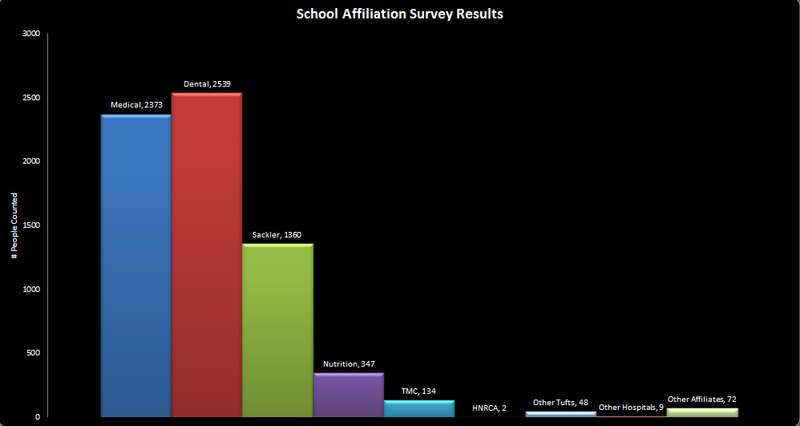 ), followed by the combined Sackler schools (PA, PHPD, and MBS) at 1,360, with Friedman rounding out at 347. The remainder was made up by staff from the Tufts Medical Center, the HNRCA, Tufts students, staff, and faculty from the other campuses, and even affiliated hospitals and schools in the Boston area. You can see the breakdown here. Anyone who spends any time around the students of the different schools knows that everyone has different needs and wants when it comes to studying and getting ready for exams. It reasonably follows to assume that it means that people gravitate toward different environments – some might study better when there’s a bit of background noise, or do better in groups, whereas other people need to be alone with their books, notes, and a coffee. So which school tends to be full of which kind of person? But the only way to get the full story is to keep going and see if you can pick out the personality types. Well, far and away it’s clear that Medical students are fans of quiet. Specifically, the quiet the 7th floor provides. Although, as you can see, it looks like if space is at a premium on that floor, people will start on the 6th and slowly work their way back down again. The Dental school, however, appears to encourage people to look for slightly different environments. Unfortunately, we don’t have data linking school affiliation to type of seating they chose (study carrel, study room, group table, etc), but it may be a safe bet to assume that Tufts’ future dentists are by and large fans of small group study, and gravitated toward the study rooms and classrooms. But what about Sackler? Well, it would appear that the combined programs of PA, PHPD, and MBS were mainly looking for a (relatively) quiet space to claim as their own, but that wouldn’t be quite the proper story. 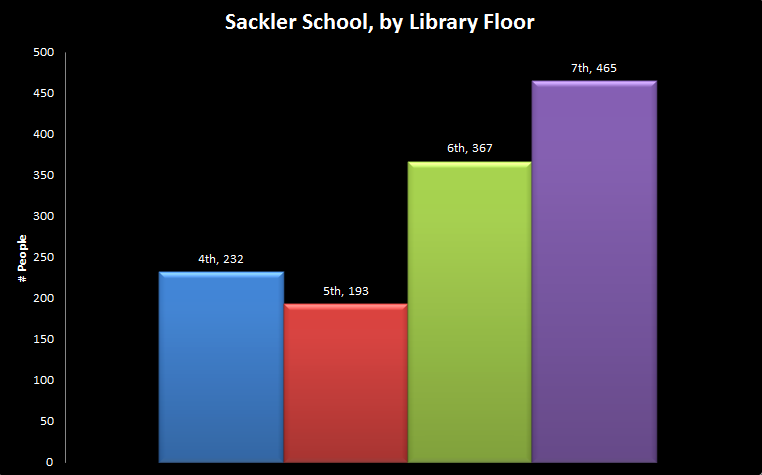 We unfortunately don’t have a breakdown of those three programs (vs. the “Sackler” umbrella), but it’s worth keeping in mind that the 6th floor has a very convenient classroom, and that the 7th floor has quite a multitude of small group study rooms. 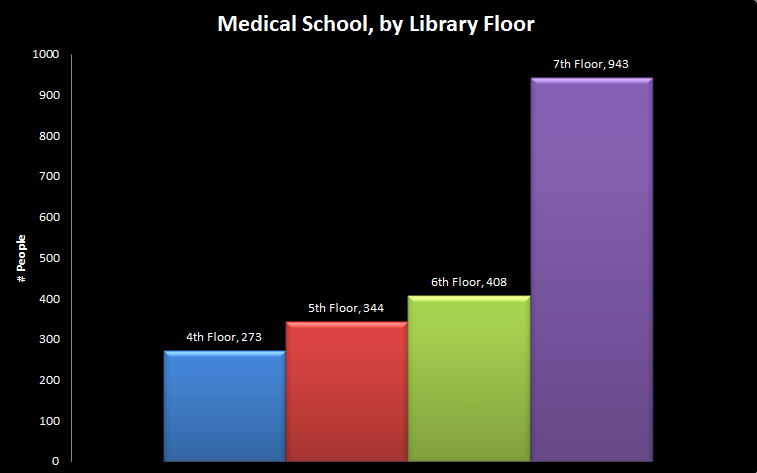 Perhaps those in the Sackler school are straddling a line somewhere between the Dental and Medical students. Which brings us, last but certainly not least, to Friedman students, who were not content to be quiet and alone up on the 6th and 7th floors. 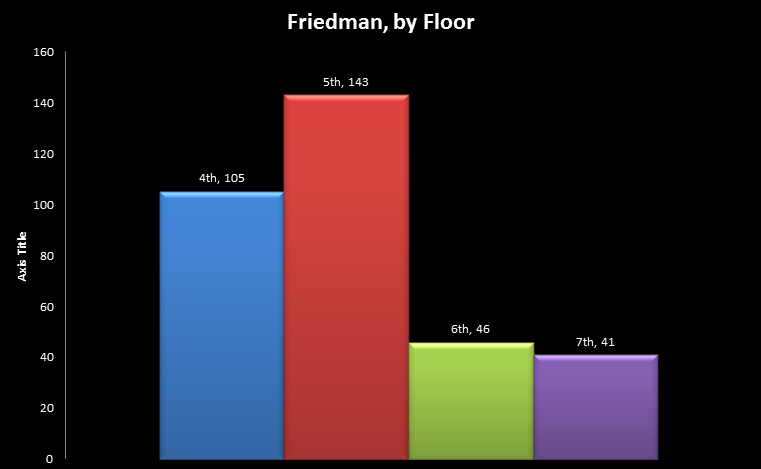 The students from the Friedman School of Nutrition much preferred the hustle and bustle of the 4th and 5th floors to the quiet and solitude of the others, and showed it unequivocally during the two weeks of our survey. Ultimately, with the sheer amount of data we collected (and continue to collect in other ways), it’s easy to get the answer to almost any question we may have. But the main question – the most important one that drives all of our programs and future planning at the library – is “What is it our patrons need?” Thanks to everyone’s participation in surveys and questionnaires like this one, we know that study space (and access to plugs in said study space) is absolutely vital, and we know who might be most likely to use what facilities. We’ve been learning other lessons, but today, that one is one that stands above the others. We will continue to do surveys like this one (although perhaps not during final exams) so that we can fine tune our answers and respond to the changing needs of our community in the future. So on behalf of the staff here at Hirsh Health Sciences Library, I would like to thank you for bearing with us and helping us learn how to serve you better. Every little bit that we can do helps, and we can’t do it without you. 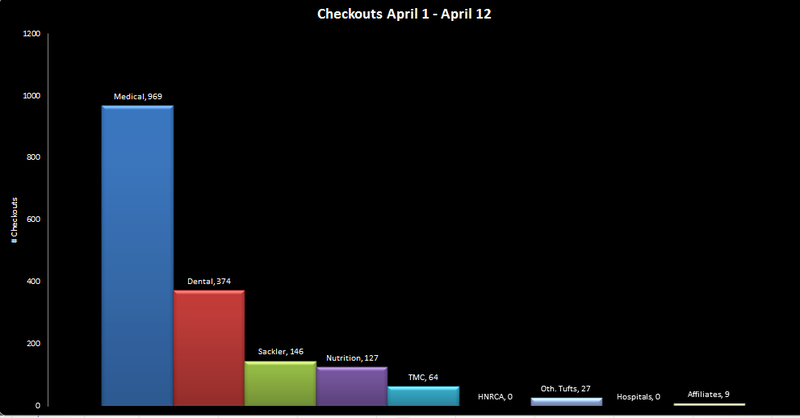 PS: if you were wondering how checkouts lined up during this time period, well…it’s fairly safe to say that the need for skulls swung that pendulum in a rather specific way.